Effective thermal insulation is about creating a seamless insulation envelope. 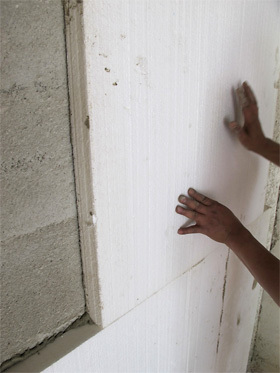 Traditional systems like insulated blocks or the widely used double wall with EPS boards in between allow thermal bridging in multiple areas. This means heat and cold are transferred around the insulation and destroy the insulating effect. 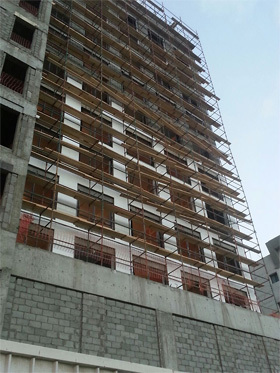 The only fireproof and permeable thermal insulation system approved by SASO. Applied on the inside or outside of a building IR25 reduces the heat transfer and ensures a comfortable living environment throughout the whole building. Its permeability makes it a perfect choice for areas with humid climate. Maximum energy savings at lower cost than traditional systems. DMC ETICS gives your building a thermal shield, protecting the inside from extreme heat during summer and chilling cold in wintertime. By completely wrapping the building with DMC ETICS system we can guarantee a constant comfortable room climate and a massive drop in your electricity consumption.